My eyes hurt and I am already homesick for my little family. My partner has been working non-stop, a whirlwind of civic holidays and teacher workshops and special tours at the museum where she works in central Philadelphia, and after a couple of days of carefully preparing her lunch, waking early with her to make sure she has breakfast before a six a.m. train, driving her to the train, picking out special things for dinner, I am at a loss for some tangible expression of my support and my usefulness to this family. This summer I am working from home, off for the season from one job and pounding the laptop keys for another job and for the novel that has been stewing inside me for years, a decade. I’m stir crazy with summer cabin fever when I decide to build the trunk and I savor the stealthy trips to the Lowe’s and the Home Depot and the claustrophobic local hardware store. After days indoors I am happy just to talk to a salesperson – when I can find one, in those rattly warehouse megastores and in the cramped Mom and Pop where no one wears a nametag. I have a plan for this trunk. I have found plans on Pinterest. I have seen Facebook friends build the living room ottoman version of this trunk and I have coveted their finished product. I go to the Lowe’s next to my eye doctor’s office and I scrutinize the wooden milk crates I might want to purchase for this project, but when I return one week later, the crates are gone and I decide to strike out into the unknown, to build the box from scratch. I can do math, after all, and I have come to the Big Box Home Improvement Store armed with a tape measure and the calculator on my phone and my writing notebook, which has been my best bet for capturing my ideas as I run from one volunteer gig to another during the summer I am supposed to be writing. As I stand in the middle of the aisle calculating the width and height and depth of the box I’m going to build I hear a random acquaintance calling my name and then I’m explaining to her that I’m building a box. A toy box, I say, for adults. A junk box? she asks. I laugh and nod. Yes, I say. A junk box. But I don’t tell her it’s not for storing junk, it’s for storing love. I recheck my math while I’m waiting for the Lowe’s employee to cut my wood because I don’t own a power saw and I find that I’ve done the math wrong. Measure twice, cut once, I repeat, the mantra enough, finally, to push away my doubts about my ability to build a box. 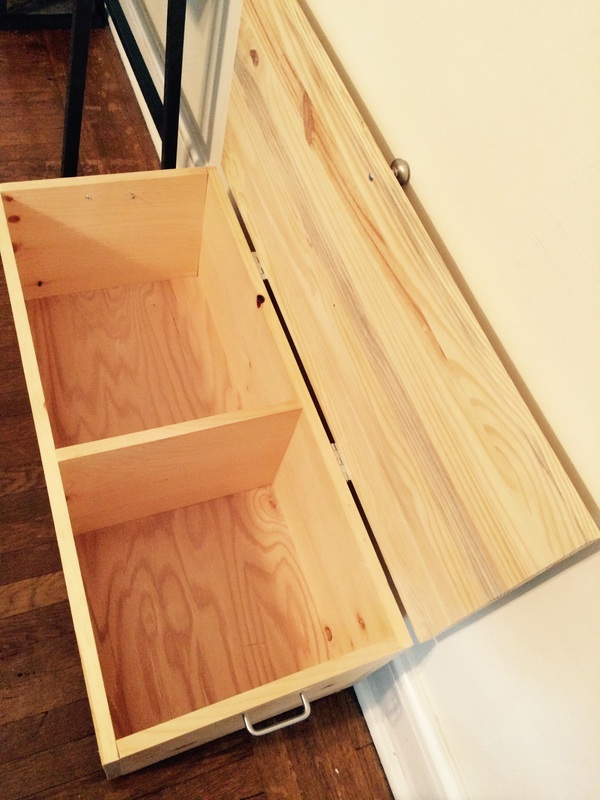 As the Lowe’s employee cuts the wood I assemble the box on an empty shelf, imagining the finished project. My cart is stocked with wood and screws and hinges that might work and a funky handle and a citronella candle that’s on clearance because I can’t pass up a sale. At home I lay the pieces out in the sunlight and rub my eyes because they are tired of looking at a screen all day and I think that this might be the perfect project to give them a break from the documents in Times New Roman 12 that just might be destroying the cups around my optic nerves. My partner comes home while I’m still screwing the box together and she’s delighted by the surprise and I’m relieved that now I can ask whether she wants compartments in her box, whether she wants a cabinet or a trunk like the immigrants once carried across the sea and the prairies and the plains. I finish her trunk in a cloud of swear words because the battery on my power screwdriver is dying and I’ve mismeasured the width of the handles and I have to take a break from the building the box so that the screwdriver can recharge. I think about the glass jars in my grandfather’s basement workshop, the lids hammered to the low ceiling, the jars screwed into the lids, all of them still clinging to the ceiling decades after his death. I imagine hammering glass jars into the ceiling of my storage room, imagine slamming my head against them or else the contents of each jar showering down on me at an angle because the ceiling in our apartment is sloped. I find a new screw, sharp and too long, and screw it into the side of the box so that the handle is sturdy and strong and I imagine the things my partner might store in this box – hardtack, heirlooms – and I realize that I’ve built a pine casket like what’s-his-name in that Faulkner novel and I wish I hadn’t built a casket two weeks before I leave home for ten days at a writing conference in Germany. So instead I pack the trunk – not a casket – with the hopes and dreams of a thousand European immigrants, my forefathers and foremothers, and my partner tells me that wood is the traditional gift for five-year wedding anniversaries, and I say, This isn’t your anniversary gift. I’m going to build you something else when it is time. ** If you’ve read this post all the way through, please tell me you’ve seen Mr. Blandings Build His Dream House.